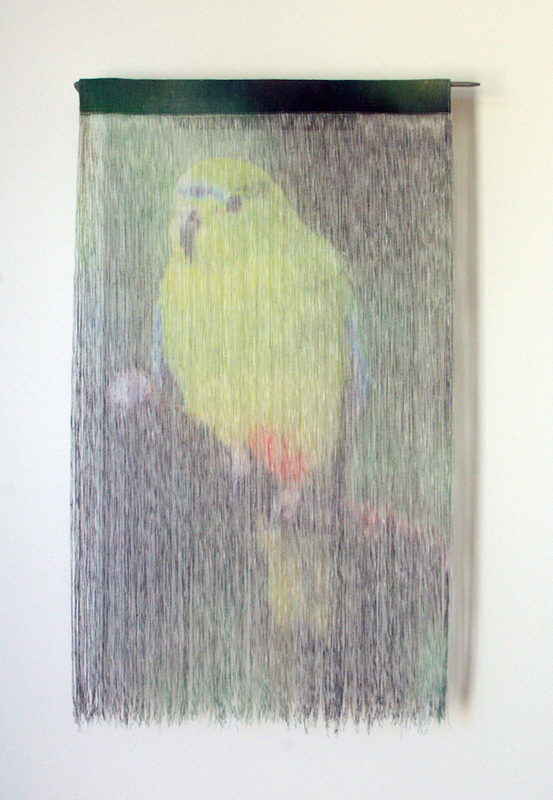 Jane Burns, By a thread – Orange-Bellied Parrot, 2018. Water-based, non-toxic, solvent free pigment ink on linen fabric, linen thread, stainless steel, 75 x 48 x 5cm. Courtesy: the artist and MARS Gallery, Windsor. In south-eastern Australia, more than 25 animal species are teetering on the brink of extinction due to habitat loss, feral animals, landscape fragmentation, disease and climate change. Amongst these are the iconic Tasmanian devil, and Victoria’s animal and bird emblems, the Leadbeater’s Possum and the Helmeted Honeyeater. Jane Burns’ collection of works takes its form in fabric, as deconstructed images of critically endangered animals native to southeast Australia. The work portrays the animal subjects in a state of disappearance. The weft threads of linen fabric are pulled away, leaving a ghost on the remaining warp threads. Up close, the image fragments into the form and texture of line and ink, unspooled from the artists fingers.